In 1977, Ann Whitehead, a local social worker, realized the pervasiveness of domestic violence in San Antonio. She envisioned an environment where victims of abuse could find respite from fear. She enlisted the help of Reverend Don Baugh, Director of the San Antonio Community of Churches, and together with faith, determination, and $400, opened the Battered Women’s Shelter of Bexar County on March 8, 1977. The three-bedroom house on San Antonio’s north side was immediately filled to capacity. Concerned citizens raised money, collected food, clothing, and diapers, and operated the shelter on a day-to-day basis for the first year. As demand for services steadily increased, the shelter moved to a larger, converted church building south of downtown San Antonio, and it remained there for 24 years. By the mid-eighties, comprehensive domestic violence literature had been developed. This increased community awareness of family violence and prompted public funding for domestic violence programs. As women revealed their stories, it was soon realized that the victims’ needs exceeded mere shelter. Many victims had witnessed violence in their homes as children, and statistics pointed to the pattern or cycle of violence. In 1987, the Battered Women’s Shelter of Bexar County initiated a program to break this cycle. The needs of both women and children were identified and programs were established to meet these needs. Services such as transitional housing, non-residential counseling, legal services, medical services, and educational opportunities and support were introduced, to comprehensively help victims of violence move toward real and lasting independence. Over the years, many collaborative relationships with other community organizations were forged to ensure that victims could easily access all needed assistance. The Battered Women’s Shelter of Bexar County became a model for the nation by introducing innovative and wide-ranging programs. For the first time, victims of family violence had real choices. In May 2002, the Battered Women and Children’s Shelter moved into La Paloma De La Paz, a shelter complex which can accomodate 222 people, and includes a school, a medical and dental clinic, and two transitional housing duplexes. La Paloma De La Paz is located on property that includes a complex of residential and supportive services that together provide a cost efficient synergy of services and expanded options and choices for all clients. 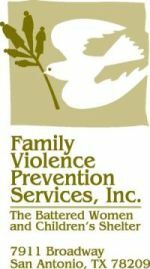 Family Violence Prevention Services, Inc. operates the Battered Women and Children’s Shelter, along with its location at 7911 Broadway where non-residential services program staff are housed. FVPS has 12 transitional housing single-family dwellings across San Antonio to assist victims of domestic violence in making a new start, and continues to work with community leaders and organizations to build and innovate, with the vision of a San Antonio free of domestic violence.